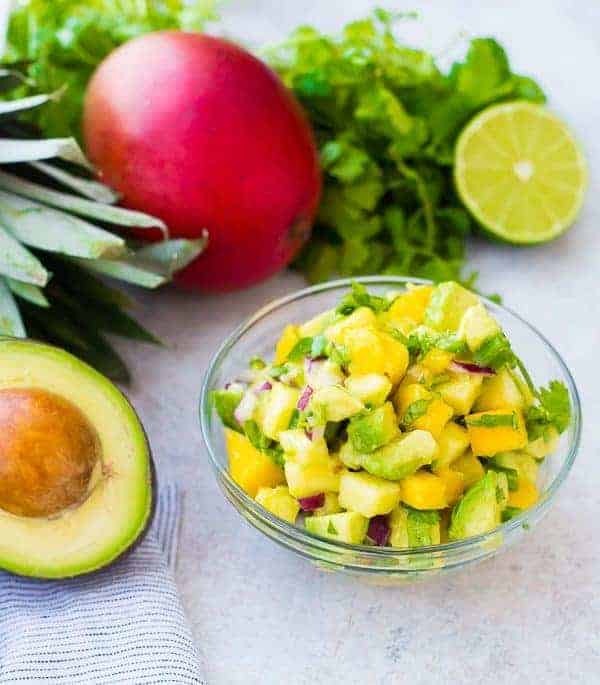 Mango Avocado Salsa is the perfect topping to any taco or salad, and it’s irresistible piled up on a chip! 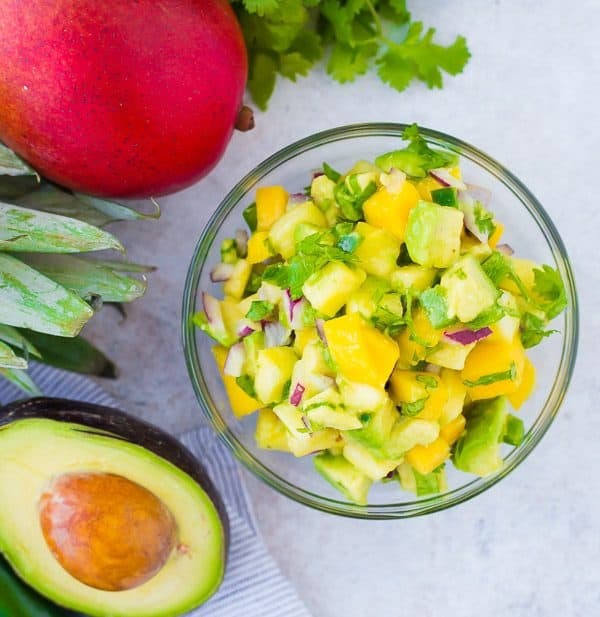 You’ll love the creamy avocado, sweet mango, and tart pineapple in every bite! Could any of you use a little escape to the tropics? Are you ready to trade in the hot cocoa for something fruity with an umbrella? The gloves and hat for a bikini and flip flops? I’ll personally pass on the bikini (I’m working on it! ), but I’ll take those flip flops, a bottle of sunscreen, and a whole bunch of sunshine. Unfortunately, I won’t be hopping a flight to somewhere warm anytime soon. I’ll be looking out the window at my snowy surroundings and dreaming of warmer months. If you’re lucky enough to be taking an actual vacation, send me a photo so that I can live vicariously through you, k? In the meantime, I’ll be tasting the tropics and closing my eyes and picturing the rest. 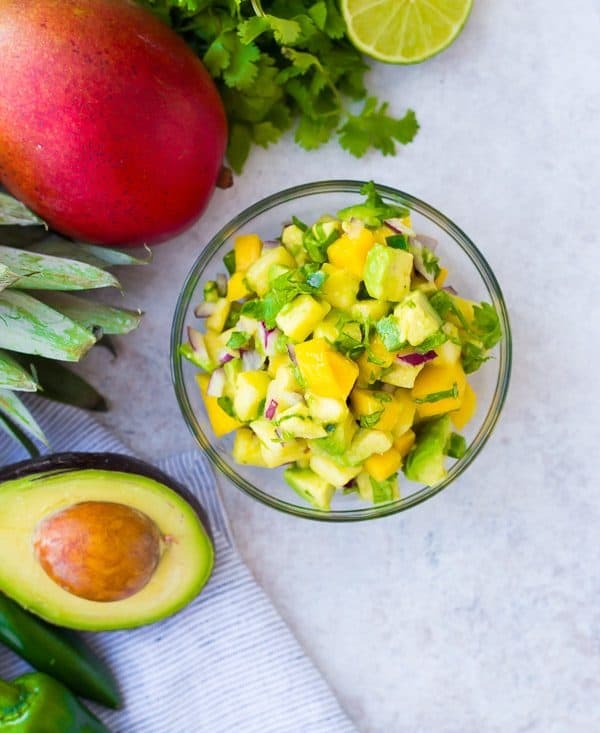 This mango avocado salsa is the perfect recipe to brighten up these cold winter days. PS: Another great one to make you feel like you’re in a cantina is this restaurant style salsa! Not only is it visually bright and cheerful, it also brings those bright flavors to your palate. 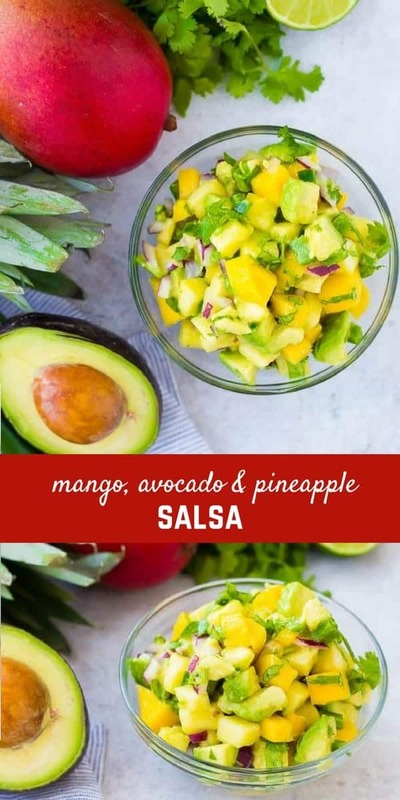 The mango and pineapple are inherently tropical flavors and the avocado smooths out those tartness of the fruit and makes this salsa feel incredibly rich and decadent. Also included in the salsa are jalapeno, onion, cilantro, and lime. These ingredients make this concoction undeniably salsa while also being reminiscent of chutney (all that great fruit!) and guacamole (those wonderful avocados!). 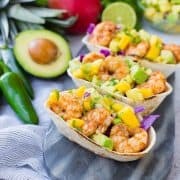 Shrimp Tacos – check back Wednesday for a great recipe! Oh and hey, it’s Whole30 compliant! Well, if you skip the CHIPS. 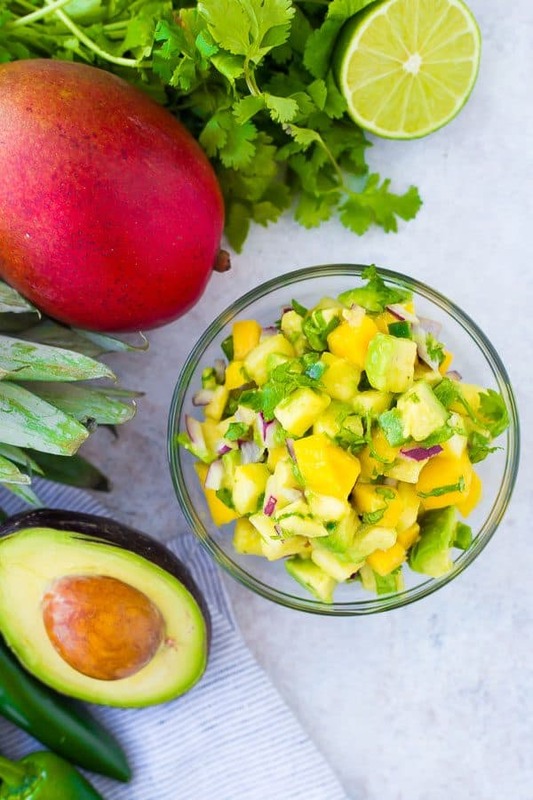 In a large bowl, mix together mango, pineapple, jalapeno, onion, cilantro and lime juice. Stir until well combined. Add avocado and stir gently to combine, making sure to coat avocado with lime juice to prevent it from browning. Serve with chips, grilled fish or chicken, or spoon on top of a salad! 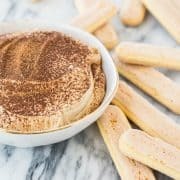 You can store this in the fridge up to two days but it will start to brown slightly. It’s best enjoyed immediately! If you want to do some of the prep ahead of time, mix everything together except the avocado. When you’re ready to serve, you can add in the avocado. If you like things spicy, leave the ribs and seeds of the jalapeno in. If you like it more mild, only use the green flesh of the jalapeno. I like to tone down my diced onions slightly by soaking them in ice water for about thirty minutes before using them. Verdict: I love this salsa – it’s going to be a staple in my house! Husband’s take: Ben’s very sensitive to the flavor of raw onions. 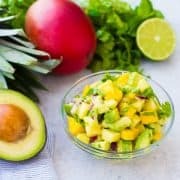 I love it in small bits like in this mango avocado salsa, but he would prefer it without the onions. He also tasted it on day two, and as it sits in the fridge, the onion flavor does intensify slightly. Difficulty: Requires a little chopping, but it’s easy as can be! Disclosure: I partnered with Avocados from Mexico to create the shrimp tacos I’m sharing in a couple of days (topped with this salsa) – but the salsa deserved a post of its own! I eat practically an avocado a day, all opinions are my own! Honestly, this is so good that I would take a spoon and have it without anything else. Great idea ! Thank you much ! No judgement here, I’d do the same thing! I bet it would taste good with salmon. It would be AMAZING on salmon! Delicious! 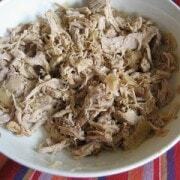 This would go so well over fish or pork!